I'm like my father in this, and he was a professional navigator, I like to keep dry on the water. He introduced me to dingy sailing in a solid clinker built Sea View One-Design. On the first outing he taught me how to follow marks on the coast and judge the wind and tide. On the second trip we reached the Isle of Wight and I learnt the rules of the sea as we negotiated the Solent traffic. And then he left me to it. He didn't like getting wet in small boats. Cruising on the QE2 was really what he preferred. I stuck to dinghies for my fun and traded up to a more exciting Uffa Fox Firefly. But that was some time ago. 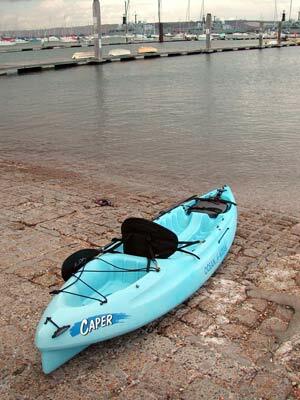 Now, semi-retired, I'm exploring home waters in an Ocean Kayak Caper. This is a medium size sit-on-top (SOT) model that I can handle myself. It's light enough to ease up onto the car roof and only requires an inflatable rack. I can carry it to the water's edge and push off without help or trailer. Think of it as a paddle board with a seat. It's unsinkable unless something pierces the tough polyethylene skin � they come in all colours. For added safety I wear a lifejacket and have a tether tying the paddle to the craft. And that's basically it � keep it simple or splash out on a raft of extras. 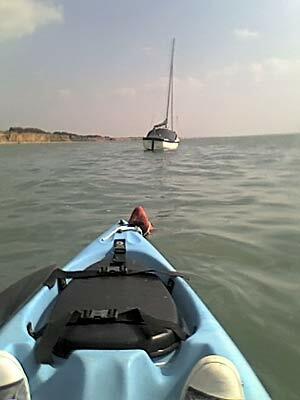 Most kayak jaunts on the sea � planned for fine weather and a helping tide � go like this. As I prep the kayak on the slipway, checking over the kit, often someone comes across to chat about marine affairs, a voyage planned, a new boat, their favourite creek, fishing tales, wildlife seen along the shore, flotsam and jetsam. However, they see I'm eager to depart and I do, paddling easily into the wind and tide, dodging the myriad moored yachts. I experience a thrill � release from urban linearity, as the boat finds its simple way among the waves. Where to? In a kayak so long as you have 20 centimetres of water, you can go anywhere. I'm attracted to prowl every limb of the harbour, ranging up sleepy lakes edged with skeletal hulks, the old steam ferryboat with its straight-up funnel; into marinas, a sleek black 60-footer back demasted from the southern ocean; under rusting piers, MOD signs to Keep Off and dangling cables; everywhere, gulls, cormorants and crows wait to the last moment before peeling away. Comfortable, timeless and appealing, sea kayaking can be as extreme as you like.